Since their conception in 2000, Counterfeit ABBA have taken their show to all areas of the UK and even worldwide! Whether performing for 75 guests or 20,000, Counterfeit ABBA adapt their show to ensure you receive only the best performance. With an impressive 6 costume changes throughout the show, only the best sound and lighting equipment, and, of course only the best performers, Counterfeit ABBA guarantee an experience not to be forgotten! The Date... January 2000. The birth of a new Millennium and also the birth of Counterfeit ABBA! Since 2000 Counterfeit ABBA have gained extensive experience performing their show not only Nationwide but also WORLDWIDE! And, because of this, Counterfeit ABBA can guarantee you a superb ABBA experience that will give you wonderful memories to cherish for a lifetime! Counterfeit ABBA insist on only using top of the range Sound and Lighting equipment to ensure you get the very best audio and visual experience Possible! And with over Six costume changes throughout the Show they are totally confident that you will be impressed! Counterfeit Abba have previously delivered their show for up to 20,000 people right through to an intimate 75! So whatever the size of audience or venue you can rest assured that Counterfeit ABBA can adapt to perform the show of a lifetime! Awesome fun. both children and adults had a fantastic evening. Many thanks to Counterfeit Abba. The band was really good and very nice people. I have not seen a party where everybody got up to dance to their first song and was still dancing along with them 90 minutes later. We all enjoyed the atmosphere they created. I would highly recommend them to anyone. They were very professional in their approach, contacting us beforehand, setting up and sound checking early and understanding the type of party we were having (70's). Warble arranged the booking and were very helpful. I can only thank ABBA - Counterfeit ABBA for making a great and memorable evening for my wife's party. Counterfeit ABBA were absolutely fabulous and they really made our wedding party go with a swing! Everyone thoroughly enjoyed the band, dancing and singing along. Great! Very professional and excellent entertainment. Fantastic! Ask any of the 500 audience. Would recommend to anyone. Counterfeit ABBA’s previous clients include: Chicago Rock Café, Brannigans, Bar Med, The Works, Grosvenor Casinos,Holiday Inns , De Vere Hotels. Counterfeit ABBA are fully self-contained and all prices therefore include: Sound Equipment, Lighting Equipment, Star Curtain Backdrop and Visual Effects. 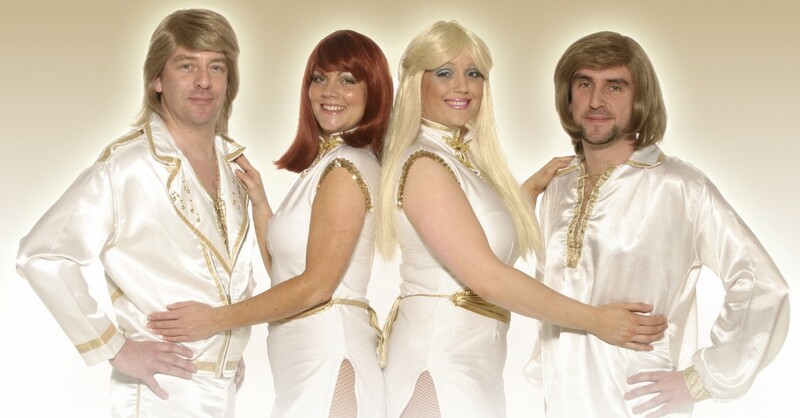 Customers who have enquired for Counterfeit ABBA have also been interested in the following ABBA Tribute Bands who cover Wolverhampton, Birmingham and the West Midlands. For more information or further options, please call 0845 643 9384.